Khieem Jackson, Class of 1994 at the California Academy of Mathematics and Science, was named deputy superintendent of Government Affairs by State Superintendent of Public Instruction Tony Thurmond. Jackson recently served as director of Government Relations for the San Diego Unified School District. Sean Garland, a fourth grader at Twain Elementary School who donates food to homeless people despite his family’s financial hardships, received surprise gifts from the Long Beach Fire and Police departments. Sean and his sister both accepted new bikes and other gifts, and his mom received $200 in gift cards to grocery stores. 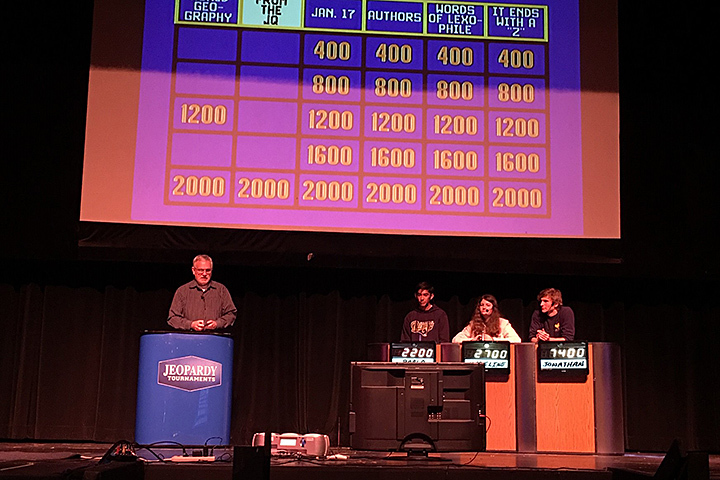 Millikan High School students recently competed in the school’s Jeopardy Tournament, the first such event for a high school in the Long Beach Unified School District. Senior Jonathan Ellens won the schoolwide championship in a tightly fought battle with tenth grade champion Madeline Jones and eleventh grade champion Pablo Diaz. “All three schoolwide finalists were great representatives for their grade levels and did an amazing job representing Millikan High School,” said Kyle Heinrich, dean of students. Board of Education President Diana Craighead was a surprise guest for the eleventh grade championship game. JEOPARDY CONTEST – Millikan High School students participate in the school's first Jeopardy contest.